The Missive Maven: Sendsomething surprises! There was a blizzard on Dec 31 here, so I didn't venture out to get my mail until Jan 1. 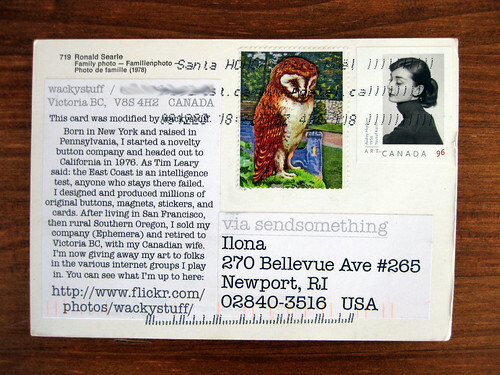 I had a lovely New Year's surprise of TWO postcards from folks at Sendsomething.net! I was totally not expecting that deliciousness, and they were both great. Love the bats! LOVE the Gorey Unstrung Harp sticker!! 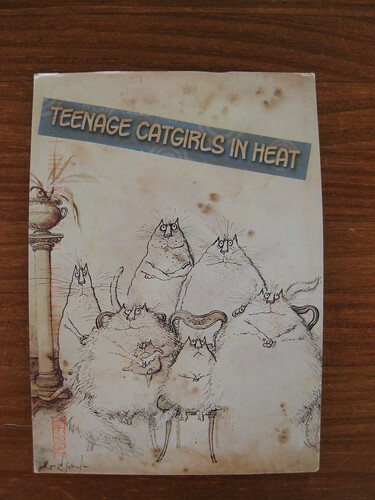 Teenage catgirls in heat?!? Awesome! Also the owl is terrific. So, I had to get some p'card responses out to the lovely senders right away, too. 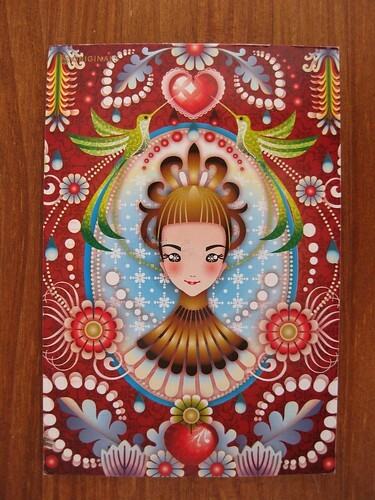 I admit I'm not much of a postcard person, and I don't have a whole lot of cool postcards on hand (unlike all the letter-length stationery which infests the nooks and crannies of my household), but the Sendsomething thing has been full of so many pleasant surprises that I may need to stock up. 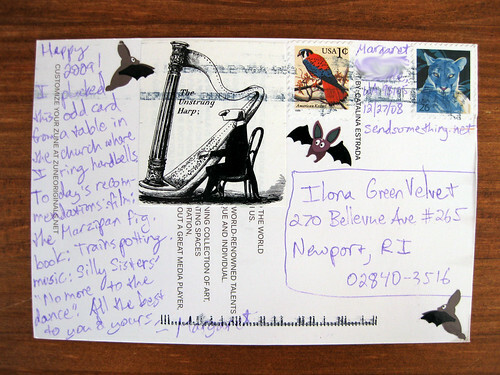 I get the sense that most Sendsomething senders use postcards as their medium. 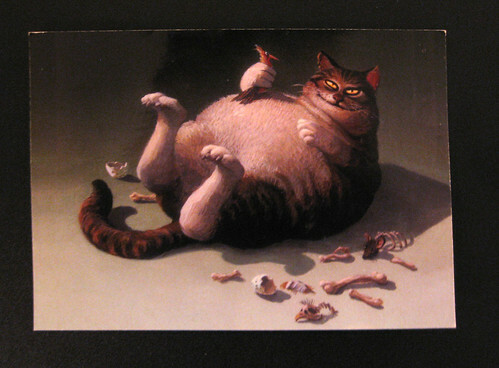 ...and when I first posted this a few minutes ago, I posted images of the back of the postcard. Then I felt bad about that, in case the recipients saw it before it came in the mail - shouldn't that be a surprise? So I took those down. Hmmm. That's one of the reasons I've been posting less outgoing mail. In hopes it will still be a surprise. Not sure what to do about it either. Hmm. It IS a quandary. I've decided that posting the envelope of a letter, or the front of a postcard, doesn't give too much away - hopefully will be a nice teaser, while leaving enough of "The good stuff" for the actual physical letter's arrival. omg moxie! 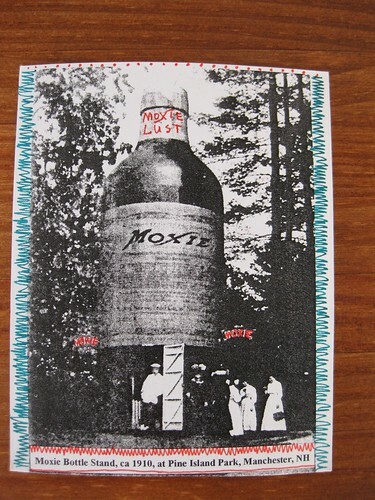 being a westcoaster I'd never heard of it until I went to college and had a friend from Boston, whose rock band's name included the word moxie. (They performed songs about George Lazenby and guacamole.) Said friend recently moved to my town so I get to hang out with him again. If only we could find some moxie to share.